CHUCK TODD: This Sunday who's party is it anyway? First, the Republicans, President Trump's reversal on immigration has conservatives furious. LAURA INGRAHAM: Imagine if he called out to the crowd, "We're going to build samples of the wall." RUSH LIMBAUGH: Is he this tone deaf? Is he this ignorant? Does he not know what got him elected? On immigration, on working with Democrats, on taxes, are we looking at a fundamental change or at a president who just wants to put points on the board? I'll ask Republican Senator Tom Cotton. Next, the Democrats, Bernie Sanders' proposal for single-payer health care. SEN. BERNIE SANDERS: Health care in America must be a right, not a privilege. CHUCK TODD: Thrills debates but not the Democrat leadership. SEN. CHUCK SCHUMER:There are many different bills out there. We want to move the issue forward we're looking at all of these. CHUCK TODD: Senator Bernie Sanders joins me this morning. Plus where Hurricane Irma hit the hardest, the U.S. Virgin Islands. GOV. KENNETH MAPP (I-VI): We lost one of the victims here. Took her right out of the building. CHUCK TODD: My trip to the Virgin Islands. There's your couch, there's your television, there's your fan. ...with former New York City Mayor Michael Bloomberg who is raising awareness and money for the area. FMR. MAYOR MICHAEL BLOOMBERG: People who've lost everything and don't have insurance, they've got to start again. CHUCK TODD: Joining me for insight and analysis are presidential historian Doris Kearns Goodwin, Al Cardenas, former chairman of the American Conservative Union, NBC News correspondent Katy Tur and David Brody, chief political correspondent for the Christian Broadcasting Network. Welcome to Sunday, it's Meet the Press. 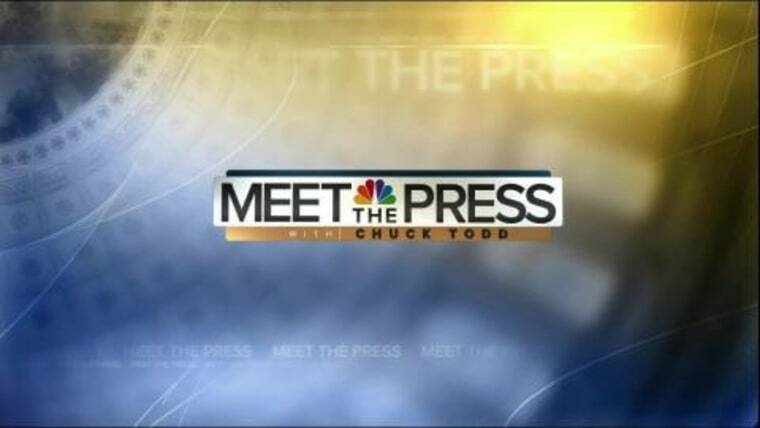 From NBC News in Washington the longest running show in television history celebrating its 70th year, this is Meet the Press with Chuck Todd. CHUCK TODD: Good Sunday morning. It was hard not to get the sense this week that both political parties were itchin' for a fight with themselves. Senator Bernie Sanders of Vermont managed to drive a wedge into a party he doesn't even belong to with his proposal for single-payer health care. The left loves it. But Democratic leaders and vulnerable senators in red states aren't quite so sure. Senator Sanders will join me in a moment on that issue. Meanwhile, President Trump pleased some moderates while enraging the right by attempting to strike a deal with Democrats to protect so-called dreamers, the young people who were brought here illegally as children from deportation. That deal would not include, reportedly, funding for his border wall. The reaction from parts of the Republican right, unrestrained fury with some I told you so smugness thrown in. Still, the dealmaker president's latest deal making has many asking does Donald Trump still plan to be a conservative president or not? Does he want to cut taxes on the wealthy or not? Does he want a deal on immigration or not? Even does he really want to build a wall or not? President Trump's first eight months in office had been largely defined by shiny object unpredictability. But his latest moves have conservatives worry that this is more than just another zig in a zig-zag presidency. PRESIDENT TRUMP: You have 800,000 young people brought here, no fault of their own. CHUCK TODD: President Trump frustrated with a stalled legislative agenda and annoyed at a lack of loyalty from Republican leaders is now flirting with the Democrats. And some of his most loyal supporters are outraged. On Wednesday night, Breitbart News led by former Trump chief strategist, Steve Bannon, dubbed the president Amnesty Don. Mr. Trump fired back. PRESIDENT TRUMP: The wall will come later. We're right now renovating large sections of wall, massive sections. We're building four different samples of the wall to see which one we're going to choose. CHUCK TODD: But conservative talk radio is lashing out. LAURA INGRAHAM: Imagine if he called out to the crowd, "We're going to build samples of the wall. Samples of the wall. And we're going to make the American tax payers pay for it." CHUCK TODD: Ann Coulter tweeted, "At this point who doesn't want Trump impeached? No promise was more central to Mr. Trump's campaign than his pledge to build a border wall." PRES.TRUMP: That wall will go up so fast your head will spin. And you'll say, "You know, he meant it." CHUCK TODD: And he attacked Democrats for pushing what he called amnesty. PRESIDENT TRUMP: Why do our leaders spend so much time talking about how to help people here illegally? They're here illegally. CHUCK TODD: And candidate Trump went even further. CHUCK TODD: You want to get rid of birthright citizenship? PRESIDENT TRUMP: You have to get rid of it. Yes. You have to. What they're doing, they're having a baby. CHUCK TODD: Now top Republicans are doing their best to play down any framework of an agreement. JOHN CORNYN: It sounds like a deal to make a deal. MICK MULVANEY: There's a deal on the table. I think it's unfair to say that there's a done deal. In fact, I know there's no done deal. LINDSEY GRAHAM: All I can say is there's a deal to be made. CHUCK TODD: It's not clear whether Trump voters will punish the president. Ultimately it's a test of who has more sway with Trump's insurgent conservative base. His critics in conservative media or Mr. Trump himself who already has his defenders. SEAN HANNITY: He can either wait around for Republicans to get their act together or he can try to forge ahead on his own and that means even reaching out to Democrats. CHUCK TODD: For now though Democratic activists are uncomfortable, Democratic leaders are enjoying the president's flirtation with bipartisanship. CHUCK SCHUMER: He likes us. He likes me anyway. CHUCK TODD: Joining me now is Republican Senator Tom Cotton of Arkansas. Senator Cotton, welcome back. SEN. TOM COTTON: Morning, Chuck. CHUCK TODD: Uh, the president struck a deal on the debt ceiling with Democrats -- Republicans weren’t in the room. He apparently seems to strike at least the outlines of what a deal on DACA will look like, which apparently is no funding for the wall, without Republican leaders in the room. Are you concerned about this? SEN. TOM COTTON: No, I think the president has said publically that there’s not a deal; that he wants to see a deal. In fact, he called me a couple nights ago to say there’s no deal. He wants to make sure that we protect the interest of American workers. In particular, by ending unlimited chain migration, which is why we have so many unskilled workers coming into the country. Asked me to sit down with Senator Schumer and some of the other Democrats. They want to focus on a package of benefits for illegal immigrants. We want to put American interests -- or American workers’ interests -- first, and we’ll do that. But there’s no deal right now, and I’m happy to work with the president and Democrats in Congress to try to reach a deal that helps American workers. CHUCK TODD: Do you think the president gave up his leverage by allowing the border wall to be not part of this deal. Democrats made that as part of the insistence. Uh, do you think that was wise by him or not? SEN. TOM COTTON: I don’t think he gave up that leverage. The wall is really a funding matter. We’ll have a government funding debate later this year. If you want to give legal status to these 700,000 or so people who are in their twenties and thirties now that came here illegally as children that's a permanent and irreversible change to American law. You'd need to make a permanent and irreversible change, in return, to protect American workers. And the way to do that is my legislation, The RAISE Act, which will stop unlimited chain migration and re-orient our green card system to high-skill workers. That's the real core of the deal. CHUCK TODD: You say if you do codify DACA into law that it's a permanent change in the system. Do you believe there is a way to just do it for these approximately 800,000 to a million folks? Or do you think this is -- it will be model legislation to deal with this problem going forward? SEN. TOM COTTON: No, I think it has to be very tailored and incremental. Congress has shown over the last 11 years three times that it can't pass a major, comprehensive immigration bill. SEN. TOM COTTON: Well, I helped stop it in 2013 because the deal was so bad then. The problem was it gave amnesty first and enforcement later, which meant amnesty now and enforcement never. It also dramatically increased the number of unskilled and low-skilled workers coming into this country at a time when blue collar Americans are still seeing their wages undercut. So what you need is a targeted and incremental deal that solves this problem of the 700,000 but also mitigates the negative side effects of it. CHUCK TODD: Can you give me a definition of amnesty? Because it's in the eye of the beholder, it feels, particularly when it comes to this debate on the right side of the spectrum here. What is your definition of amnesty? CHUCK TODD: So you do believe this is amnesty for DACA? SEN. TOM COTTON: Well, if you pass the so-called DREAM Act, it will be the single biggest amnesty in the history of the United States. Even bigger than the 1986 amnesty, which Ronald Reagan said was his biggest mistake in office. But the core debate here has never been about legal status for these 700,000 or so people. It's been how are we going to control the negative side effects of that, which is undercutting American jobs and wages, my legislation, The RAISE Act would do that. And deterring more illegal immigration. I mean, put yourself in the shoes of a parent in El Salvador right now. If you had the promise of American citizenship for your child trying to get away from the poverty and the violence in that country and we pass a straight amnesty with no effort to increase enforcement or to change our green cards, wouldn't you take a very dangerous risk to get your child to the United States for the next amnesty? That's why we can't simply codify DACA. We also have to deal with the negative side effects of codifying DACA. CHUCK TODD: I want to talk about the atmosphere overall among some conservatives. I had a very animated never-Trump conservative radio talk show host on my Meet the Press Daily earlier this week. Take a listen to Steve Deace. When I was never-Trump, Chuck, they told me if I didn't vote for Trump we'd have amnesty, record debt and Obamacare. And guess what? They were right. CHUCK TODD:It's obviously filled with a bit of hyperbole. But there is a growing chorus on the right, a little bit of “I told you so” when it comes to Donald Trump. Do you still trust him to be a conservative president? SEN. TOM COTTON: You know, I always want to support the president when he's right. When he's wrong, I'll try to change his mind. And if he doesn't, I'll have to oppose him and support what's best for Arkansas. But I think that's the most constructive approach to trying to work with President Trump or for that matter any president. CHUCK TODD: Is his frustration with Mitch McConnell warranted in your mind? SEN. TOM COTTON: I think his frustration is with Congress as a whole. The president doesn't have so much of a leadership problem sometimes. He has more of a membership problem. But that's not uncommon. You've seen that in the Democratic Party as well. Just this week Bernie Sanders introduced his single-payer health care bill. I'm glad he finally recognizes that we need to repeal Obamacare, which as well we do. And that's divided the Democratic Party. That's just the nature of Congress. But it's also the nature of our separated system of government. CHUCK TODD: Do you still have trust in Mitch McConnell? I mean, he's become a divisive figure in this Republican run-off in Alabama Senate. And there is this sense of the grassroots not so happy with McConnell. Insiders -- what do you tell your constituents who complain about him? SEN. TOM COTTON: I work very well with Senator McConnell. I think he does a difficult job very well. And Senator McConnell has encouraged me as well, just like President Trump, to sit down with our Democratic colleagues and try to reform our green card system in a way that serves the interests of American workers. CHUCK TODD: I want to touch on a few other topics. North Korea, it seems it's always sound and fury. It's always sanctions. Nothing seems to work. It does appear the administration's looking for a credible military option that at least somehow makes Kim Jong-un blink, but he's not blinking. What should the next step be? Should the next step be continuing to try to sanction North Korea? Or should we be putting more pressure not just on China, but Russia too? SEN. TOM COTTON: Well, I believe you'll see at the UN general assembly this coming week President Trump sitting down with many world leaders trying to build even stronger consensus on North Korea. There's still areas of their economy that we can sanction. We should take those steps. But as you say, Chuck, we should especially put more pressure on China. China can do more. China forced us to water down sanctions that the United Nations a couple weeks ago relating to oil imports into North Korea. China right now would rather have a nuclear North Korea than a denuclearized North Korea. Why? Because what did you just ask me? You asked me about North Korea. You didn't ask me about China's economic warfare on the United States or militarizing new islands in the South China Sea or their attitude towards Taiwan. We have to put pressure on China though to achieve our objective, which is a denuclearized North Korea that can no longer threaten America. CHUCK TODD: One other topic: I have not seen you weigh in on the proposed transgender ban. You are a recent veteran of these wars of the early 21st century. Where are you on this issue? CHUCK TODD: -- a transgender person? SEN. TOM COTTON: -- I don’t know. I didn’t go around asking them that. Just like I might have served with a gay or lesbian soldier as well. But what we have to focus on is the readiness of our forces and the readiness of individual units and individual soldiers. And make sure that they are prepared to fight and win our country’s wars. CHUCK TODD: Do you have any sense that they’re not? SEN. TOM COTTON: I think we have to wait for Jim Mattis’ report. Just like Bob Gates went through a very thorough review and made this assessment. But I want to make sure that the focus in our military is preparing our soldiers to fight and win our wars. CHUCK TODD: Alright, Senator Tom Cotton, I’ve got to leave it there. Thanks for coming on. SEN. TOM COTTON: Thanks, Chuck. CHUCK TODD: We do appreciate it. Now for the Democrats. As you just heard Senator Cotton talk about, there's a divide on that side of the aisle too. It wasn't too long ago that proposing single-payer health care would have been considered too toxic politically for Democrats to do. Apparently not anymore. Senator Bernie Sanders of Vermont did that just this week. And he may have split left-leaning Democrats from the party leadership. And for many Democrats seeking reelection next year in swing states or even red states. Well, joining me now is the Independent senator, Bernie Sanders of Vermont. Senator, welcome back to Meet the Press, sir. SEN. BERNIE SANDERS: Great to be with you, Chuck. CHUCK TODD: So let me start with this, why was this week the right time to propose a solution that, in your mind, would replace Obamacare over time? And the reason I ask it that way is Republicans are still trying to repeal and replace Obamacare on their terms. Did you just add sort of more chum to the waters here by proposing a, an alternative that would be a version of repealing and replacing Obamacare? SEN. BERNIE SANDERS: No. I think the immediate concern is to, is to beat back these disastrous Republican proposals that would throw millions and millions of people off of the health insurance that they have, raise premiums for older workers very substantially, cut Medicaid, uh, by hundreds of billions. So that is the immediate concern. But, Chuck, there comes a time when we have got to ask ourselves “why are we, the United States of America, our great nation, the only major country on Earth not to guarantee health care to all people as a right?” Second of all, “why are we spending twice as much per capita on health care as any other major country, all of whom guarantee health care to all of their people?” And our health care outcomes are not necessarily better. Third, “why do we pay, by far, the highest prices in the world for prescription drugs?” And in my view, a Medicare for all, single-payer program will address those issues and guarantee health care to all people in a cost-effective way. And that's the direction that we've got to go. It's not going to happen tomorrow. I fully admit that. But we need to put the benchmark down there and go forward. CHUCK TODD: Well, I want to ask you about the cost issue because, as you know, some of your friends on the right, I put “friends” in quotes here, are referring back to an old conversation of yours having to do with the cost of expanding the health care system. Let me play it and get your reaction on the other side. SEN. BERNIE SANDERS: You want to guarantee that all people have access to health care, as you do in Canada. But I think what we understand is that unless we change the funding system and the control mechanisms in this country to do that, for example, if we expanded Medicaid, everybody, all right, give everybody a Medicaid card, we would be spending such an astronomical sum of money that, you know, we would bankrupt the nation. CHUCK TODD: Obviously, senator, the issue of this is the idea of health care for all is something that has majority support. And then when you remind people how much it could cost, how much taxes go up, then people get concerned. And obviously you were concerned about the finances there. Explain what you mean and how you can change the funding system to not make this so astronomical. Okay. Very good question, Chuck. But here is my hope, you and I are going to discuss this within five minutes. I would hope very much that NBC and CBS and ABC allow us some serious discussion time to explain to people in our country why we are spending so much more than other countries. But very briefly, and I would hope that we can have an hour discussion at some point on this issue, very briefly this is what we're going to do. Number one, private insurance companies in this country spend between 12 and 18 percent on administration costs. And they're administering hundreds of different private insurance plans. You have a deductible of $5,000, I have one of $8,000. It is incredibly complicated and very costly to administer. The cost of administering the Medicare program, the very popular program that works well for our seniors, is 2 percent. We can save approximately $500 billion a year just in administration costs. Second of all, because we pay so much more per capita on health- for our prescription drugs, by having Medicare negotiate drug prices we can save over $100 billion there. So that's a lot of savings. Thirdly, and here is the important point, my Republican friends say, "Well, Bernie wants to raise your taxes." They forget to conveniently mention that Bernie wants to do away with the private insurance premiums that you're now paying. For example, Chuck, the average employer has a worker who makes $50,000 a year is spending $13,000 a year on health insurance for that worker. The worker himself or herself is spending $5,000. $18,000. Now if our plan goes into effect that $13,000 private insurance premium disappears for the employer. It goes down. The amount of money that the worker is now spending, that $5,000 goes down. We replace private insurance premiums with Medicare premiums. The average middle class worker saves money. Well, I, I,I guess the question I have for you though is how do you convince some 80 percent of Americans who do get health care from their employer that it is worth re-jiggering the system again? That seems to be the other challenge here. Because, as you know, people that get employer-based private insurance are basically happy with their insurance. The people that are not happy are those in that other 20 percent. Well, yes and no. And, in fact, we are going to need a lot of discussion. And, again, I would hope that on NBC, CBS, ABC we could begin to have that kind of discussion in a serious way. But here is the truth, you know, Gallup does a lot of polling on this issue. And what they find out is that the most popular health insurance program in this country is Medicare. People, seniors, feel really good. Veterans Administration ranks very high. In fact, private insurance company is not all that popular. Well, we have to tell the average worker the only thing that is changing in this program, this is not, quote, unquote, a government takeover. The only thing that's changing is the color of your insurance card from a Blue Cross Blue Shield card, a United Health card to a Medicare-for-all card. You're still going to go to the doctor you want. It's the same structure. --a fair point. A fair point. Let me ask you, as you know, your former primary rival Hillary Clinton is on a book tour. She wrote a lot about you in this book. I just want to play one quick excerpt and get you to respond on the other side, sir. I was arguing with my supporters at the Denver Convention in 2008 about why they had to quit complaining that I didn't win and get out and support Barack Obama. And I didn't get that respect from him and his supporters. As you know, you've probably seen at least some excerpts of the book. I don't know if you've fully read it. But this is a consistent theme. She believes you didn't work hard enough to bring your supporters to the fold the way she did in '08, which is what she was pointing there. And if anything, your supporters may have undermined her candidacy in the general election. Do you accept that criticism? Wow. No, I really don't. And I- look, Chuck, right now we're focusing on health care, we're focusing on the DACA issue, we're focusing on infrastructure, high-cost of prescription drugs. I don't think it's useful to go backwards. I think we've got to go forwards. But let me just say this, I worked as hard as I could after endorsing Hillary Clinton. I went all over this country. And I would remind people, you know, people say, "Well, not everybody who voted for Bernie ended up voting for Hillary." No kidding. That's what happens in politics. If my memory is correct in 2008 something like 24 percent of the people who voted for Hillary Clinton in the primaries ended up voting for John McCain. That's the nature of politics. Most people, you know, are not rigidly Democrats or Republicans. They vote where they want. I worked as hard as I could to see that Hillary Clinton was- would be elected president. Speaking of the Democratic Party, you're, in some ways, the most influential member of it. Yet you're not technically a member of it. The filing deadline to file as a Democrat for the United States Senate in Vermont in 2018 is about three months earlier than it is for you to file as an Independent. It's in May. Do you plan to file as a Democrat or as an Independent, when you run for reelection in 2018? Well, I will do what I have done in the past. Let me just say something about this, the current model of the Democratic Party obviously is not working. Republicans control the House, the Senate. They control the White House. They control two-thirds of the governors offices throughout this country. In my view, Chuck, what we need to do is to reach out to Independents. There are a heck of a lot more Independents in this country than there are Republicans or Democrats. I am an Independent. I've always been a Democrat. I have worked within the Democratic caucus in the House and the Senate for over 25 years. I'll continue to do that. CHUCK TODD: Is that a litmus test or--? SEN. BERNIE SANDERS: Actually--it's not a question of a litmus test. I think that the Democratic Party has got to reach out to working people. It's got to reach out to young people. Has got to come up with a progressive agenda. And, by the way, that agenda is gaining momentum. Fifteen dollar an hour minimum wage. Putting $1 trillion into rebuilding our crumbling infrastructure, transforming our energy system. That's the agenda we've got to fight on. All right, Senator Sanders. I'm going to leave it there. I look forward to our more extensive conversation though on how to do single-payer health care, how to pay for it because there's a lot of details that we need to get to. Thank you, sir, for coming on and sharing your views. Coming up, shining a light on the area hardest hit by Hurricane Irma, the U.S. Virgin Islands. My trip there this week with former New York City Mayor Michael Bloomberg. Welcome back. The panel is here. Al Cardenas, the former head of the American Conservative Union; NBC News correspondent Katy Tur, author of the new book, Unbelievable, My Front Row Seat to the Craziest Campaign in American History; and presidential historian, Pulitzer Prize winner Doris Kearns Goodwin; and David Brody, chief political correspondent for the Christian Broadcasting Network. Welcome all. All right, Doris, I'm going to start with you. Donald Trump, what do you see from your historian's eyes that he's up to? Well, it seems to me that it all began when things started falling apart over the last eight months. He lost his mojo. He always talks about losers are the worst people in the world, and he was losing. So he had to do something to get it back. He goes to Harvey. It seems good for him to be looking empathetic, and people feel good about it. And then he comes back and he announces the DACA thing, and then people get outraged at the idea again, so he loses that sense of positive momentum. So then he calls in Chuck and Nancy and he makes the deal for the debt funding to get the flood relief to Texas. And then he feels good again. And “whoa this is feeling good.” So impulse takes over, and he does the next thing to talk to them about DACA. So I think the question is can an impulse become a strategy over time? Because it feeds that sense of himself. Without that confidence, I mean, he once said his best temperament, the reason he was better than any other president ever was because he always, always won. Well, he'd always, always lost in these first eight months, and he blames the Republicans. He has to blame himself, and the question is even if the strategy works and it produces more people liking him and the base stays with him because they like the fact that he's a winner again, which is what I think they always liked about him, then his unforced errors will still be there. The temperament that tweets. Al, is that what you're seeing? What do you think? Yeah, I think we're seeing stage two. We're not paying enough attention to John Kelly's influence on what's going on in the White House. I think the president is a product—any president is a product of the input they receive. Because they're drinking water by a fire-hose every single day. And I think in this case there's a lot of intramural infighting that was taking up a lot of the president's time, a lot of in-house intrigue. I think that Steve Bannon, frankly, and some of his viewpoints were not in keeping with anything you could get done in Congress. And I think John Kelly came in, you know, he's cleared the deck. And now it's an organized process where the input is more positive. And I think John Kelly is not a policy-driven person. He's got his own points of view. but he's a “let's get things done” general. And I think some of what we're seeing is a result of his being in the White House. Now some never-Trump conservatives, David, are doing—I think we used the phrase I told you so smugness. Jonah Goldberg writes this fascinating line, "What really matters to him," referring to President Trump, "Is praise. It was only a matter of time before the moth flew to the glow of public opinion." Basically confirming Doris' take here. You know, I see it a bit differently. I think this is strategy. And Donald Trump is not one to twiddle his thumbs while Mitch McConnell and Paul Ryan get their act together. You know, his DNA is in deal making. And he's not going to sit around and wait for that. And so why not go and talk to Chuck and Nancy and all of that? Look, I think the big narrative that's been missed here is that Donald Trump's base that we hear so much about is not a constitutionally conservative Tea Party base. It just isn't. And it goes across party lines. And I know we talk about independents and Democrats. But it's more that. It's blue collar. A lot of these voters, if you will, want to punch politicians in the face. And here's Donald Trump doing it. And so if it's Chuck and Nancy or Mitch and Paul, who cares? The bottom line is he's been talking about this bipartisanship for a while here. David's right about that. The Trump voters, they're not conservative voters. They're not Democratic voters. They're not independent voters. They're not Breitbart voters. They are Donald Trump voters. And he has a keen sense of that. But you also have to look in whatever room Donald Trump happens to be in. If he's in a room where he's going to get a roar for talking about the second amendment or talking about the wall or talking about Hillary Clinton, then he will do that. If he's in a room with Chuck and Nancy, who is he going to try to befriend in that room or try to make happy in that room? Chuck and Nancy more so than Mitch McConnell. Mitch McConnell is a master of his own silence. Donald Trump does not work with those people in the same way that he does somebody like a New York senator. And don't discount the value of being the senator from New York. Is this a strategy? I don't think it's a strategy. I think this is gut impulse for him. And he will go whichever the wind takes him. Wherever he feels he can see a win or feels he can hear the loudest roar. But I have to say, is he risking more than he realizes here when he messes with immigration? Only because if there was one issue that animated him in those primaries it was immigration. You know, I think if he risks himself and he loses his confidence and he's not feeling good, he risks everything that people voted for him for—that he was a fighter, and he's going to stand up for things. I'm not sure that one issue is going to break the—we always keep thinking a bridge too far. But of he loses—and I think he was losing himself. He didn't appear happy. He didn't have any sense of humor. And he didn't feel good. And then who is he if he doesn't feel good and he doesn't get the applause? If you lose yourself, you lose everything. And DACA is the easiest of the puzzles to serve in comprehensive immigration reform. If you're going to take on immigration, DACA is the safest bay to play in. And I think that's what's going on. And if you line up eight to ten evangelicals in the street, they're all for the Dreamers. I mean, this should be a relative slam dunk for him. The wall is the issue clearly. And look, in 2020 when he starts to campaign again he's going to need to come with eight and a half by 11 glossies of, "Hey, here's some blueprints and here's some..."
...that's true. I'm not sure that's true. I think that at those rallies when people would come and yell, "Build the wall. Yes Mexico was going to pay for it," a lot of the sense was this was part of the show of the rally. This is what we do. But when you would talk to people about their support for Donald Trump holding steadfast to any one of his positions wasn't mandatory for them. Not even the wall. There was a time in the campaign where the wall looked a little cloudy. Like, they were talking about having it be a cyber wall or fencing around the border rather than, you know, a concrete wall that Donald Trump had been proposing. And when I asked his supporters whether or not they would feel undercut by that or duped by that they would generally say no. They would just trust Donald Trump's judgment. And guess what? Let me throw—it's as if you segued me for me. Let me throw up Marc Short, he's the chief legislative aid for the president. Here's what he said in an interview this week on this very topic. "I think that what the definition of a wall is something that we all need to have a serious conversation about." "It is a myriad of different structures along the wall that we expect to be secure to make sure that America is safe." So it can be a fence. But, you know, that's not what, you know, Laura Ingraham's not going to accept the fence. Rush Limbaugh may not accept the fence. Trump voters are not listening to Laura Ingraham. Or even Breitbart the way that they're listening to Donald Trump. Remember, they were anti-Trump for a while. And they had to turn and become pro-Donald Trump when they realized that's where the movement was going and that's where the base was going. And I'll say this, you know, I think it was well-said. Trump is the brand now. All these commentators that orbit around the brand are going to find out that they're going to have a miserable day if they think they're going to be able to attract that populous. And, in fact, they're going to seem like the establishment now, in a certain sense. The critics that are going after him. I think the problem is the brand still is going to suffer from whatever is going on with the Russia investigation. And then that old temperament's going to come out. You know, Stevenson once said, "The problem is not how to win an election but how to win an election without proving you're unworthy to win." And if that starts to ratchet up then the old Trump, no matter how happy he's making everybody, is going to come floating right back. All right. I'm going to pause it here. I promise we've got an even longer segment coming up where we can finish this discussion. But up next Hurricane Irma cost lives, caused untold damage in Florida. Still no power for many schools in Miami, believe it or not. And they're trying to open schools Monday. But as bad as that was, the devastation is even worse in the U.S. Virgin Islands. I went down there with former New York City Mayor Michael Bloomberg. And we're going to show you what we saw when we come back. Welcome back. Florida is only now beginning to recover from last week's onslaught by Hurricane Irma. More than a million people, by the way, remain without power in five southeastern states. It's been a while since Irma hit. The misery there is real. But if you want to know what an area looks like when it takes a direct hit from a category five storm just see what's happened to the U.S. Virgin Islands. In Saint John 80 percent of the structures have extensive damage. At least four people are known to have died and others are still missing. Here's one way to think about it. Residents say the area's turned from green to brown as all the leaves on the trees have been blown off. When a local pointed this out to me you realize and you're like, "Oh my God, it's as if it got scorched." I traveled to the Virgin Islands this week with former New York City Mayor Michael Bloomberg. Bloomberg says he wants Americans to focus attention on their fellow American citizens in the Caribbean. And he says his experience helping New York recover from Hurricane Sandy can help the U.S. Virgin Islands recover as well. CHUCK TODD: The aftermath of Hurricane Irma on the U.S. Virgin Islands. Most residents left with nothing. On Saint Thomas, just the frame of a government-built housing project still stands. I mean, you can just see people's living rooms. Literally just blown and all the remnants -- there's your couch, there's your television, there's your fan, there's all the things. When you think about it, it's all there. The majority of the power lines on the island are destroyed. And Saint Thomas and Saint John officials are still assessing damage without any sense of when power will be back on. So why you here? What got you here? FMR. MAYOR MICHAEL BLOOMBERG: What got me here? One of my partners has a house here. Called. Said there's a real problem. You read about it in the paper but unless you're on the ground you don't really understand it. He marshaled some of our people, brought them down. People that have worked on Hurricane Sandy for the city. We lost one of the victims here. Took her right out of the building. But folks stayed in here five, six hours with that wind and survived it. And yes, that's island native and 15-time NBA All-Star Tim Duncan on the left. Bloomberg's team arrived with supplies and their expertise. So now we know that we're going to work on changing the building codes and strengthening them. One of the things we did in New York when we were recovering from Sandy is we started focusing on long-term how do you prevent it at exactly the same time. And we got a lot of criticism. They said, "No, no, you've got to just take care of the short-term. You've got to get it going." And at the beginning when people see the destruction that's when you can get some support of making a long-term investment. Once you get six months later, nobody wants to do it. You move onto the next problem. The island of Saint John got the brunt of the storm. Just everything, that looks like a ghost town in there. An estimated 80 percent of the island's structures suffered extensive damage. We just pulled into Saint John. This is of the three main Virgin Islands. Saint John’s is the one with the smallest population. Approximately 4,000 residents. And this is the most -- they're hurting the most. The most destruction is here. The most dire situations are here. Mayor Bloomberg brought all the supplies, brought specifically for the needs that are here in Saint John. It's hard to look at. It's hard to see. Look at this. Look at this destruction. It doesn't look as if anything -- There's another power pole down. Not a single structure has escaped damage. Even the most basic necessities, including vital medications are slow to arrive. What's the meds that you're running of the most? What's the biggest need? So our biggest need has been insulin, tetanus, normal saline for IVs for rehydration and IV, you know, IV drugs. Yeah, we're seeing a lot of, you know, traumatic injuries, strains and sprains, lacerations, you know, things that you would expect from this environment. Also people who are having problems with their chronic medications. I was going to say running out of prescriptions. President Trump who visited Florida last week also plans to come here. And Bloomberg thinks that is a good idea in order to bring attention to the dire situation. But just saying, look, U.S. Virgin Islands are part of America. We care about you guys. It gives everybody that lives here more confidence and pride and a belief that help will come. And number two, it does increase the help because people say, "Oh I didn't know they needed that. I'll give some money. I'll volunteer." They're going to need hundreds of crews of electricians to put up all the cables. Every power line. Money's not going to be the issue here. They're trying to lock it up because everybody's mass evacuating. What's success look like here? Success will look like here six months from now when all the corrugated metal that blew off, all the wreck cars, they'll all be gone. Unfortunately, there'll still be lots of people who had a real job in tourism and they've got to bring tourism back. People who have lost everything and don't have insurance, they've got to start again. Unfortunately the story may not end there. There are three storms brewing in the Atlantic. And one of them, Maria, may be headed to the Caribbean and the Virgin Islands this week. Coming up, what sounds like an easy question, how many major political parties are there in the United States? Probably think the answer's supposed to be two. Not necessarily. There might be a third and you might belong to it. That’s next. CHUCK TODD: Welcome back, Data Download time. Diversity and culture continue to be major fault lines in American politics. That's what we learned in our latest NBC News Wall Street Journal poll that examines social trends in America. But we learned something else too. There's increasing evidence we're no longer talking about two parties when it comes to the way these issues break down. We're talking about three. Democrats, Republicans and the party of Donald Trump. Let me explain. The true Trump voter is one who told us that their vote was solely for Donald Trump and not some vote that was against Hillary Clinton. Yes, we asked that difference. These voters stand apart from fellow Republicans in some key ways. Let's start with immigration. Does it add or strengthen the United States or does it detract and weaken? 16 percent of Democrats say it detracts and weakens, 43% of Republicans answered the same way. But a majority, 55 percent of true Trump voters, say immigration detracts from and weakens the United States. Another issue, gay marriage. 77 percent of Democrats are in favor. 42 percent of Republicans are too. But only 31 percent of true Trump voters agree. It's a big gap between the GOP as a whole and the true Trump voter. How about the news media? Does the news media pay too little attention to the issues of working Americans? 48 percent of Democrats said that bothered them. 65 percent of Republicans. Among true Trump voters that number was an astounding 76 percent. Finally, does it make you comfortable or uneasy that the nation is becoming more diverse and tolerant of different lifestyles? Only 10 percent of Democrats said they were uneasy. 44 percent of Republicans said the same. But over half of true Trump voters, 56 percent answered the same way. So the true Trump voter is starting to look like its own distinct arm of the Republican Party if not quite a separate party in and of itself. How will these voters react to the president entertaining a deal with the Democrat leadership on DACA? A majority of them believe immigration weakens the country. Our data shows this is not a group looking for compromise or moderation. So will they continue to stick and trust the President Trump they got to know as a candidate? We're going to soon find out. When we come back, ever since President Trump made his fire and fury statement North Korea has moved closer to becoming a genuine nuclear threat to the United States. Does America have any options left beyond more tough talk? ANNOUNCER: Coming up, end game brought to you by Boeing. Continuing our mission to connect, protect, explore and inspire. ANNOUNCER: End game, brought to you by Boeing, continuing our mission to connect, protect, explore and inspire. Back now with end game. I want to begin because the week is going to be taken up a lot by North Korea. But it seems as if, it seems as if we are running in place on North Korea. I put together a montage of the last four presidents, including this one, on all of their North Korea promises. Take a listen. All Americans should know that as a result of this achievement on Korea our nation will be safer and the future of our people more secure. We look forward to the day when we can end the Korean war. That will end, that will happen when Kim Jong-un verifiably gets rid of his weapons programs and his weapons. North Korea's nuclear and ballistic missile programs pose a great threat to the peace and security of the world. And I strongly condemn their reckless actions. Obviously North Korea is a big, big problem. And we will deal with that very strongly. Each president has had this on their plate. Each one has been flummoxed on what to do, David. Yeah. And I think this week at the UN I think the White House is going in with a sober approach here. They understand. They want to see what sanctions will do. But let's remember, we have a wild card president here at this time. And he might be a different clip in your montage afterwards because, look, senior administration officials early on in this administration were talking to me and others about how this is a major, major problem to the point where military action, indeed, may come to fruition at some point. And if any president is going to do it I think a lot of people know in their gut that it's going to be potentially this president. Ironically here, Doris, and I've heard this actually from the left and the right, they-they wish they had a credible military option. Because it seems that Kim Jong-un doesn't believe us. Well, the fact that no previous administration has been able to crack this code means that it doesn't make sense to just call them all weak. He’s got to figure out why have we not been able to? And maybe a militarily option has to be considered. But you can’t allow, this is where you need Kelly again, you can't allow some spontaneous comment about fire and fury to even mobilize him even further as they did to have more missile tests. You need a clear process within that, just like the Cuban missile crisis was a much better situation the decision making than the Bay of Pigs had been. We have to make sure that decision making is rational options using every diplomacy possible, figuring out what are still there. You can't allow spontaneous tweets to have anything to do with North Korea from now on. We're a logical country. And most of us expect people at some point in time to behave logically. But as Doris mentioned, I lived a Cuban missile crisis. There's a madman that put 11 million lives at risk and gladly did so. Gorbachev, if you read the transcripts from the-that era, even Gorbachev was amazed that he was willing to be so, you know, so risk-taking that he would put all his people at risk. In this case, unfortunately it looks like you're going to have those military options in place, the diplomatic options in place. But it's a kind of case where you almost have to get close to having to press a button for something to happen. You're missing two pieces of the puzzle, Russia and China. And what happens with them? And how do you have a military option if you can't get China on board for that? If you can't get South Korea on board for that? If you can't get Japan on board for that? Remember, the place that's in the most danger would be Seoul, South Korea. And if we have a military option are we willing to essentially sacrifice the South Korean capital? And that's really difficult. Well, I think they're looking at the future of the party. And I think, as you said, the party hasn't done well in the states and the local areas much less the national government. And they need a soul back. And maybe this is supposedly a symbol for their soul. Some Democrats think he is. But I think the idea that, um, people don't identify with parties the way they used to. This is why your other thing was so interesting. They don't feel, "I'm a Democrat. I'm a Republican. I'm an independent." So parties have to begin to build on issues and on policies that people care about whether this is the one to do it or not I don't know. David, your beat, in many ways, is the intersection of religion and politics. I've got to ask you this poll question that came from --PPR-- RRI this week. And it was asked this, "A politician who commits an immoral act, can they still behave ethically?" White evangelicals in 2011, only 30% of them thought that was the case. In 2016 it was 72%. Why, essentially it's clear, white evangelicals are giving Donald Trump a pass on his moral behavior. Why, Why this change? Well, if you look at it, 2011, 2016 what happened in between? Barack Obama's second term. And I think a lot of white evangelicals believe that it is time from a moral perspective to fight for a new Supreme Court justice or whatever you have.The point is is that Donald Trump has become this culture warrior for evangelicals. It's fascinating. I mean, talk about God having a sense of humor. I mean, he's a, he’s a culture warrior for evangelicals. There are pro-life leaders calling him the most pro-life president there's ever been. Could this hurt them long-term though if he sells them out? Now,well, if he sells them out. Hurt the movement. That they won't be taken seriously on moral issues. Well, let's be clear the Chuck and Nancy show, so to speak, on dead issues and deficit and all that, that, that's fine. When I say that's fine, that's going to be okay in non-evangelical world. But evangelical world, much different. If he crosses them, got to be careful. Alright, guys, by the way, Katy and I did an event at 92nd Street Y in New York City this week. And it was so good we thought it would make a good podcast and it did. Katy is my latest guest on the Meet the Press podcast, 1947. Get your pen ready. Going to be signing those books. Congrats, Katy. That's all we have for today. We'll be back next week because if it's Sunday, it's Meet the Press. You can see more end game and post-game on the MTP Facebook page.